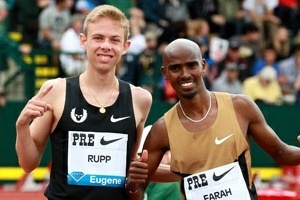 "I won't be going to the Games to race the 5,000m, but I'm not so disappointed because I have my place in the 10,000m. 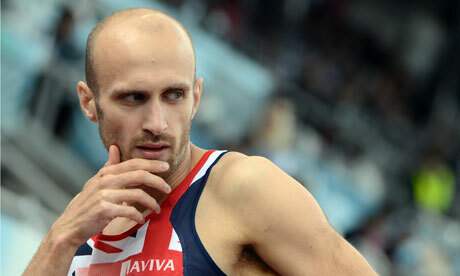 I don't have enough training under my belt to go in the 5,000m." 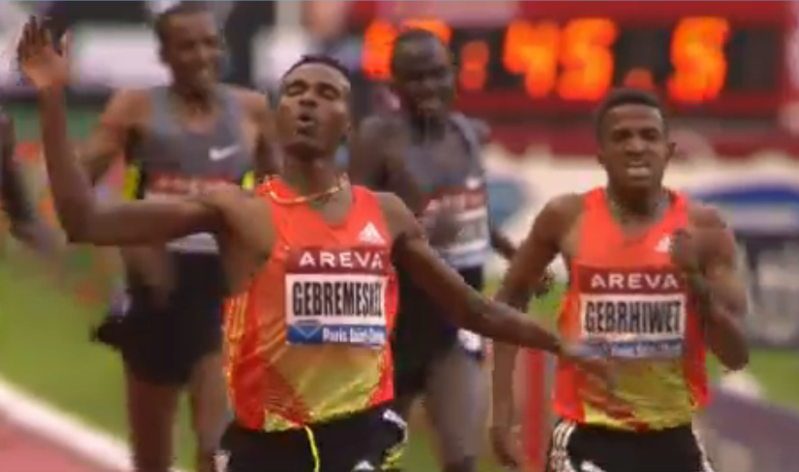 - Kenenisa Bekele, talking after running a seasonal best 12:55.79 in Paris. 12:55 sounds good, right? Well, the bad news was it was the deepest 5,000 in history as 6 guys broke 12:50 and 11 broke 13:00 and Bekele only finished 9th, as Bernard Lagat's and Galen Rupp's medal chances got tougher. Areson out of Nike OP? Any women left? Honest poll: did you ever drink and drive? The Precursor To The Olympics: The 126th Wenlock Olympian Games Start Sunday They are designed to "promote the moral, physical and intellectual improvement of the inhabitants of the town and neighbourhood of Wenlock, and especially of the working classes, by the encouragement of outdoor recreation". Canada Names Its Olympic Team Cam Levins is only in the 5,000. 200m Olympic Gold Medalist Donald Quarrie Says Jamaican Athletes Need To Pursue Events Outside The Sprints "Not everyone can get a lane in that 100m ... and there is room in the 400m; there is room in the 800m and in the 1,500m." In another quote, he implied that the current culture is too lazy to do distance training. Olympic Steeplechase Champ Ezekiel Kemboi To Race At London Olympic Despire Assault (Stabbing) Charge He was arrested on charges of stabbing a woman last week. Kenyan Distance Runners 1,500 And Up To Stay In Kenya To Train For Olympics, 800m And Down (Rudisha And Jelimo) Have Left To Train In UK Good decision. Rec. 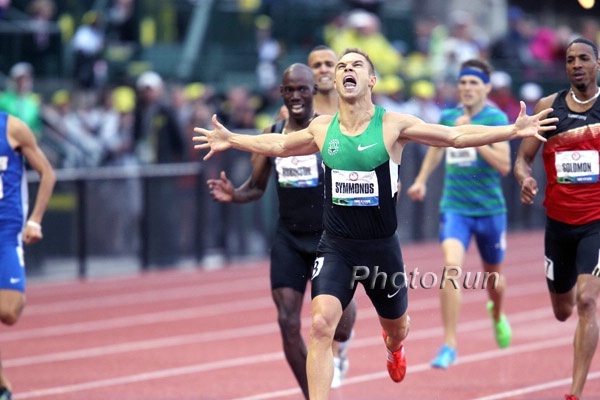 Read: The Real Story Of Matthew Centrowitz's Gutsy Bid For The Olympics Oregonian Centro had surgery on his knee April 10th and didn't do speedwork until May. Canada: After Winning Canadian Champs, Nate Brannen Ready For Olympics #2 Brannen says he almost did not sleep at all in the 48 hours up to his Olympic semifinal in 2008. He also says he's got 4 good years left in his body. Down Goes The Champ: Yohan Blake 9.75 Over Usain Bolt 9.86 At Jamaican Champs, Shelly-Ann Fraser-Pryce Runs 10.70 This makes both Blake and Fraser-Pryce the fourth-fastest of all time. FloJo, Jones, and Jeter are the only ones faster than Fraser-Pryce. 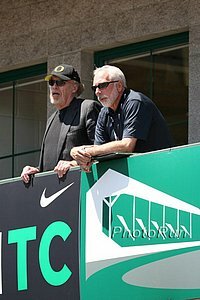 Lananna Expected To Leave As Oregon Coach Curtis Anderson reports Lananna will stay at Oregon in an administrative role, so we guess that means the Stanford AD job is out. *US Spokesman Greg Walker Says Lananna Not Stepping Down We'll take Curtis Anderson's word that Vin is out. 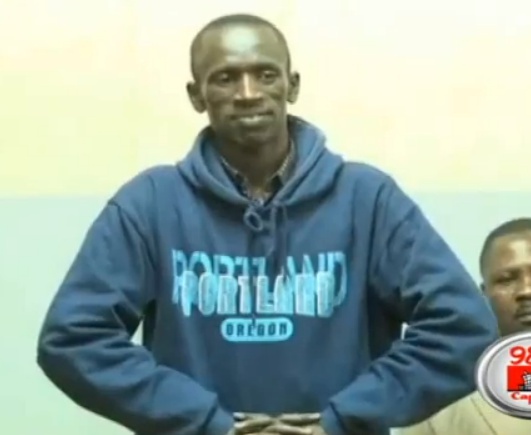 Ezekiel Kemboi Arrested In Stabbing Charge The Olympic steeplechase champion has been arrested for allegedly stabbing a woman who denied his sexual advances. He denies the charge and says he tried to take the woman home and attackers tried to rob him. Picture of Kemboi at court (to left) and here. Three With A - Marilyn Okoro, Emma Jackson And Jemma Simpson - All Appeal We agree that GBR's best chance of making the final is to put three people out there instead of 1. Three x .10 is greater than 1 at .20. Q&A With Coach Bobby Kersee On The Dead Heat The only option he was against was the coin flip. Doping Statistics: Which Sports Are Tested The Most And Which Test The Most Positive? Not surprisingly, cycling had the highest positive test rate. Soccer was the most tested and track was second. 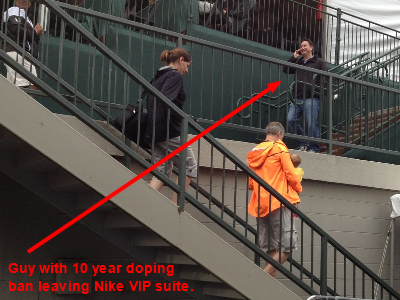 NY Times Writer Accuses IOC Of Being Arrogant, Elitist, And Corrupt "In London, more than 250 miles of V.I.P. traffic lanes are reserved not just for athletes and I.O.C. luminaries but also for corporate sponsors." Video: Interview With Jeneba Tarmoh Talking about her conversation with Allyson Felix: "I feel like if I would have won fair and square, that's how it should be. They shouldn't change their mind. If it was you, they wouldn't have changed their mind." 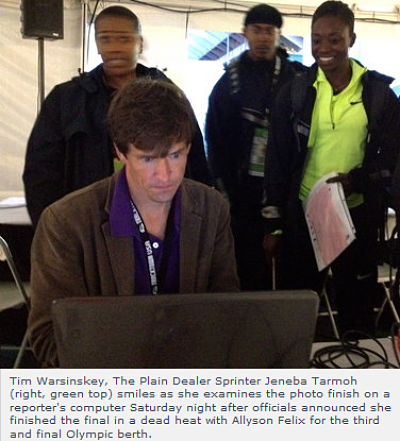 *NBC Broadcast With Interview On Tarmoh Pulling Out Of Run-off Also quoted by AP as saying she didn't run "because I believe I earned that spot, because I believe the emotional roller coaster they put me through was too much to go through at the moment." Recommended Read: A Look At The Upbringing Of Ashton Eaton Who's "Been Training For The Olympics Pretty Much His Entire Life" Eaton: "I think the reason the decathlon is so appealing is because it's like living an entire lifetime in two days. You have the ups, the downs, the goods, the bads, the comebacks. It all happens in two days, and everybody loves life, and I think that's why we love the decathlon." 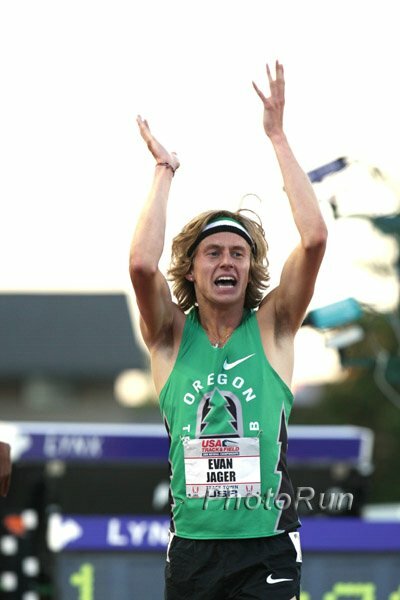 Ben True May Have Competed With Lyme Disease At The Olympic Trials He finished 12th in the 10k and 6th in the 5k. Not bad for a guy who might have Lyme. *Jeneba Tarmoh Says She Felt Bullied By USATF To Make A Decision, But That She's At Peace With It Now "I felt pressured into having to make a decision. They said, 'Do you want to concede or do you want to run?' I was like, 'Are those my only two options?' They said yes, so I said, 'Yes, I will run.' 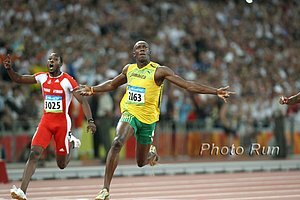 But then as I was going throughout the day, I thought about it and I ran that 100m, I took my victory lap, I went through the press conference, I got my medal, and then they tell me I have to run again, after I ran six rounds of the 100m and 200m? I just had a whole lot of emotions and was heartbroken because in my mind, I felt like my joy was kind of taken ..."
Tarmoh Feels Tired & Robbed, Tarmoh-Felix May Be Off Friend of LRC Tim Layden of Sports Illustrated has an exclusive story saying the run-off may be off. The first year pro Tarmoh feels robbed because Roger Jennings told SI.com (thanks to the exclusive LRC interview with Jennings that set this whole thing off), "If I went back and read that photo 100 times, I would call it the same way every time (for Tarmoh)." 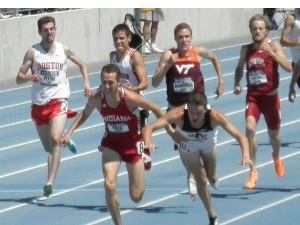 Amazingly, USATF asked Layden for a copy of the article late Sunday night. Did USATF not know what their head timer said over a week ago? Have they not heard of Google? Unbelievable. Tarmoh: "In my heart of hearts, I just feel like I earned the third spot. I almost feel like I was kind of robbed." Greatest Long Jump In US History? 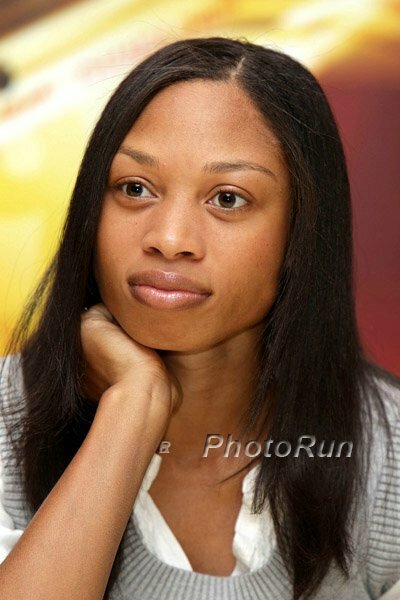 Chelsea Hayes Jumps 17-Inch PR To Make Olympic Team In Long Jump It was the first long jump in US history with 3 women over 23 feet, as Hayes had the huge PR on her final jump to take the lead. Reese passed her on the final jump of the competition that was called a foul, then overturned. 400 Hurdles: Michael Tinsley Wins Hurdles As Angelo Taylor Clips Hurdle, Batman Misses Out, Lashinda Demus Wins Women's Batman tweeted here about Taylor hitting his hurdle. 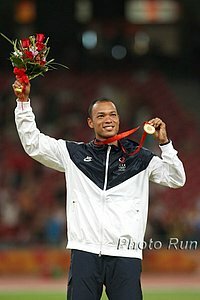 Men's 200m: Wallace Spearmon: "If I didn't make the team this year, that would have been on my mind for the rest of my life." LRC *Check Final Prediction Contest Scores The scores are unofficial and we still need to put Felix in there for a tie for third (we'll have two thirds regardless of the runoff) so that will be one more point. LRC USATF Explanation On Why Alice Schmidt Is In The Final Let us just say for the record: "Alice Schmidt should not be in the final." It is not logical. 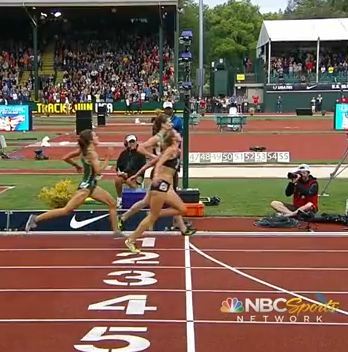 LRC Gabriele Anderson Reinstated And Put In Final: "She's in. There is a god in track and field after all." That's the quote from Anderson's fiancee Justin Grunewald. Video of the rightfully-reversed DQ is here. Thread on DQ here. *Women's 1,500m Post-Race Interviews: Simpson, Uceny, Rowbury, Hasay, and more. LRC Flash Men's 1,500m Semifinal: Wheating Has To Make Late Charge To Advance, Favorites Advance Russell Brown did not get through. LRC German Fernandez Is Turning Professional updated Fernandez looks back on his collegiate career and says the 5,000 is his best event. RG3: "If I wake up one day and it’s 2016 and I say I want to go run the hurdles again, I can do that." 1,500s: LRC Recap Of 1,500 Prelims Since USATF in its brilliance only ran three heats of 10 instead of three or four heats of 12, hardly anyone was eliminated. The favorites all looked pretty good. Two guys without the "A" - Will Leer & Jordan McNamara - looked great in the men's action as well and got heat wins. LRC Semi-Live MB Coverage/Discussion Of Thursday's Action The women's 1,500 first round is in the books. 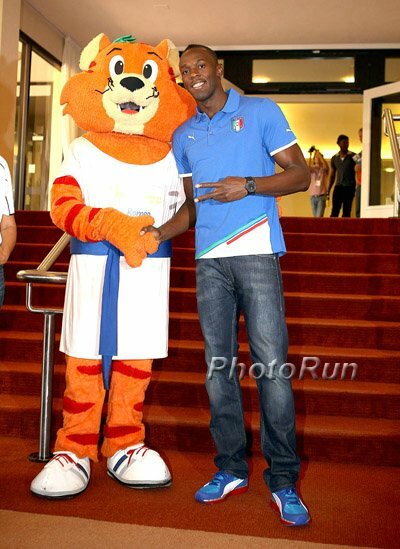 *MB: How long would it take Lagat to break the American Record in the steeple?? 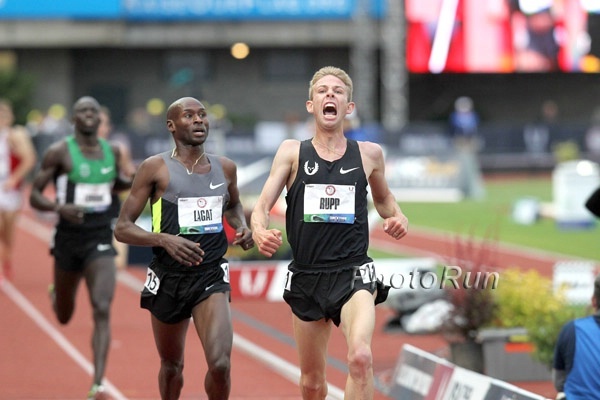 LRC Alan Webb's 2012 Olympic Dream Is Over article link updated w comments from USA Today, SI The dad-to-be faded to last in his 5,000m heat and immediately after said he would not run the 1,500 at the Trials. It's soul-searching time for Alan Webb. Article, links and video. LRC 5k Prelims: Alan Webb, Jackie Areson And Brie Felnagle Go Home - Lauren Fleshman Does Not Alan Webb finished last in his heat and then announced he won't be running the 1,500. Some other big names went home as well, including 2012 US #3 Jackie Areson. LRC Steeple Prelims: All The Favorites Are Through As US Champ Billy Nelson Barely Makes The Final Former US Champ Steve Slattery did not advance. In the women's race, Emma Coburn showed why she's the favorite as she tempoed to victory in her heat while some others tried and failed to hit the "A" standard. 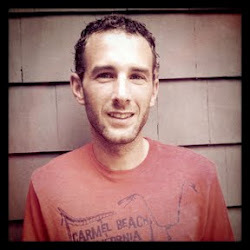 LRC An Exclusive Interview With The Man Responsible For Reading The Allyson Felix 100m Finish Picture LetsRun.com exclusively caught up Roger Jennings, the man whose job it is to determine who finished third and who got fourth, and the timing whiz explained how it was determined there was a dead heat. Plus we do a little bit of research and determine that even though USATF has said there is no protocol for breaking a tie, that the USATF rule book does in fact envision such a scenario and has a solution - a old-fashioned drawing of lots!! !